For many health-conscious folks out there, a blender is a crucial kitchen appliance to have in the home. It enables you to prepare and enjoy healthy drinks in a matter of minutes. You just put the ingredients inside, press the button, and voila, you have a freshly made smoothie. But some blenders are significantly better than others and this is especially true for Vitamix blenders. If you’re shopping for a blender, then perhaps you might be interested in the Vitamix 6300, one of the latest creations from this brand, under its C-Series line. NOTE: The Vitamix 6300 did not make our “Top 3 Vitamixes Of 2017” list because we believe better value for money is available in other models. A full review is still available below. 1 Why Is This Vitamix Worth Considering? 2 What Do Customers of the Vitamix 6300 Blender Say? 3 How’s It Different to the Vitamix 5200, the 7500 and the 750? 4 What’s The Best Price for the Vitamix 6300? 5 Verdict: Is This Blender For You? Why Is This Vitamix Worth Considering? More than 4 million people have a Vitamix blender at home and yet the company only has 4 employees in its repair department. That’s a testament to the brand’s quality and design. It’s been proven time and again in various tests that Vitamix is simply better than its competitors and this is probably the reason Vitamix is able to command such high prices for its blenders. The engineering quality meets the usual Vitamix standard, and it’s designed to be very durable so it should provide you with many years of service. Vitamix backs its claims of durability with its 7-year warranty, which is not standard for the blender industry. But it’s the standard warranty for Vitamix. It will look good on your kitchen countertop. The design imbibes the classic look of older Vitamix designs, and you can pick colors from black, white, silver, red, and cream. Vitamix acceded to the requests of customers who complained about the lack of preset settings in the 5200 model, so now the 6300 has 3 preprogrammed settings: smoothies, frozen desserts, and soups. You no longer have to figure out by yourself just how long the blender should run for whatever you’re preparing..
For those who like to do things manually or prefer to fine-tune their purées and salsas, the 10-setting feature is still here along with a pulse setting. You can also make dips, nut butter and many types of drinks without having to use any attachments. You don’t have to do any twisting or scraping either. It features a powerful 2HP motor that powers the 3-inch 4-pronged stainless steel blade to travel as fast as 240 mph. That means it can cut through any fruit, vegetable, and even ice. This is healthier for you because the process emulsifies the ingredients more than your teeth is capable of doing. The process creates enough friction that you can end up with boiling soup. The blade is strong enough and the angle is just right. The motor is also durable enough to withstand daily use with no problem. It even protects you when you accidentally drop a metal spoon inside the blender when it’s running. The blade is designed to snap when that happens to protect the motor. Just tell customer service—yes, you can actually tell the truth about your clumsiness—and you’re still covered because of the warranty. The 64-ounce container is large enough for medium or large batches. That means it’s great for the whole family, or for an individual who wants to prepare a large batch for the whole day. The container is also shatter-proof and free from BPA. It also comes with spill proof wet and dry lids. The lid is designed to let you add more ingredients to the blender even while it’s still running. It comes with an opening for the tamper too, which is included in the deal. It’s very easy to clean. You just dust the outside, and to clean the inside you just need to pour warm water and a drop of liquid dish soap, run it for 30 seconds and you’re done. Aside from the classic tamper, you also get a DVD and a cookbook as freebies. And of course, you have the whole Internet and a large family of Vitamix users to interact with when you want to know more. You can also call customer support if you need help. They’re quite helpful. What Do Customers of the Vitamix 6300 Blender Say? 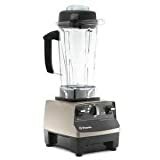 If you go to Amazon you’ll discover that the typical Vitamix 6300 review simply raves about this blender, and the vast majority of the Vitamix 6300 reviews give it full 5 star ratings. Many of the customers say they are quite happy with their 6300, and they would not hesitate recommending it to their friends. (This validates a 2009 marketing study that showed the typical Vitamix owner recommended the brand to an average of 13.4 people.) They appreciate its efficiency and quick results, and they also like how easy it is to clean. Those who’ve had their blender for more than a year have remarked that it still runs like new. Most users don’t mind the noise, as that’s common with powerful blenders. Very few have complained about the high price. Many of the users actually consider the price for the 6300 as a wise investment. Some did admit that the price made them wary at first, but in the end they were quite satisfied with their purchase. How’s It Different to the Vitamix 5200, the 7500 and the 750? When it comes to the Vitamix 6300 vs 5200 debate, it all depends on the value you place on the addition of the preset settings and the pulse setting. The additional cost of the 6300 hinges mainly on this, although the on/off switch is also different. In the 6300, it’s now a power button that you just need to push, unlike the 520o power switch that resembles a light switch. The 5200 also has a smaller container. Of course, since the 6300 is a newer model then it looks more modern and probably a bit more durable as well. Now if you are trying to compare the Vitamix 6300 vs 750, the only deciding factor here is your design preferences. The 6300 has a retro Classic design, which is what it basically looked like when it first became popular. It’s a traditional look that evokes a timeless feel. You get the feeling that 10 years from now, that look will still work—as it has in decades past. Meanwhile, the 750 epitomizes a more modern design. It’s also more expensive than the 6300 (and probably all the other models out there), but it comes with 5 preprogrammed settings and a shorter profile (it’s shorter by 3 inches). It’s also very quiet. Then again, it has a more powerful motor which means it consumes more electricity. What’s The Best Price for the Vitamix 6300? A brand new 6300 model retails for about $600 on the Vitamix website. Vitamix does offer an installment plan so that you don’t pay a lot at once and the sting of the price won’t be as severe. However, you can usually find the best deals on Amazon.com. The catch there is that prices change almost daily so you’re probably better checking there on any given day. You can also find used and refurbished models on Amazon, which are usually a bit less expensive. Although in this case i believe the price difference is not enough. You may as well get a brand new one so you’re fully covered by the 7-year warranty. If you are in the market for a good blender, you have to first take into account certain factors like how often you’ll be using it, what kinds of food you plan to make with it, how much you’re willing to spend for this kitchen appliance, and so on. If you have already thought about these things and have also considered all the points we’ve mentioned in this review then we’re sure you won’t regret buying the Vitamix 6300. Some people might balk at the price at first (there are blenders out there that cost a hundred dollars or less) but price should not be the only basis for your decision. Think about how convenient it is to have the Vitamix 6300 in your home. Cleaning it is easy; making soups, smoothies and health drinks can be done quickly too. More importantly, you don’t have to worry about buying a replacement anytime soon. With the 6300, eating healthy and staying fit won’t be so difficult to do, even your kids will love it.